Something for the weekend? Yes please! 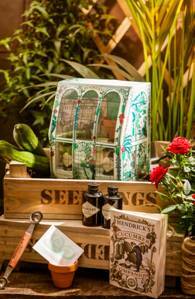 Here’s a lovely new addition to the Hendrick’s range – the Hendrick’s Cucumber Hothouse complete with cucumber growing kit. And you get to mix your own Hendrick’s & T with a pair of minis too. An ideal introduction to the curious world of Hendrick’s Gin and its unique ingredients, the Cucumber Hothouse also includes a book of simple cocktail recipes designed by Hendrick’s Ambassador to Britain, Duncan McRae. James O’Connor, Senior Brand Manager for Hendrick’s at William Grant & Sons UK commented: “The off-trade gin market is worth over £350m and almost 90% of sales go through the grocery channel. Super premium gins like Hendrick’s are introducing a whole new audience to the category, people who are interested in exploring new flavours and interesting serves and brands. Stir the vermouth and Hendrick’s Gin in a mixing glass with ice to dilute and chill. Then strain into a martini glass and garnish with a cucumber ball or three. The Hendrick’s Hothouse pack is available now in selected supermarkets at an RRP of £15.